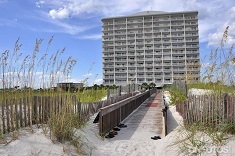 Orange Beach AL condominium home for sale at Tidewater. Nicely decorated 1BR/1BA unit in Tidewater complex! Built-in bunk beds, queen sleeper sofa and has full sized washer/dryer. Unit painted in 2017. Nice private balcony! Tidewater amenities include a large outdoor pool, indoor heated pool, hot tub and sauna. Exercise room overlooks the Gulf! Great rental! This is a must see!